Ten Strawberry Street Colored Gold Rim Glass Charger Plate 13"
Home > Products > Ten Strawberry Street Colored Gold Rim Glass Charger Plate 13"
Impress guests by adding a new dimension to your table setting with the Ten Strawberry Street Colored Rim Gold Rim Glass Charger Plate 13". 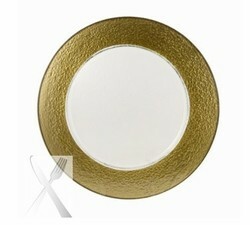 Designed to accommodate any size plate, this charger is defined by its gorgeous gold rim that beautifully frames food. Perfect for use in modern, traditional, or elegant settings, this charger plate is made from premium quality glass that has a delicate look while being exceptionally tough and durable. To properly care for this charger plate, hand washing is recommended.